As I was setting up for this week's shoot (yes, on Wednesday morning - oops! 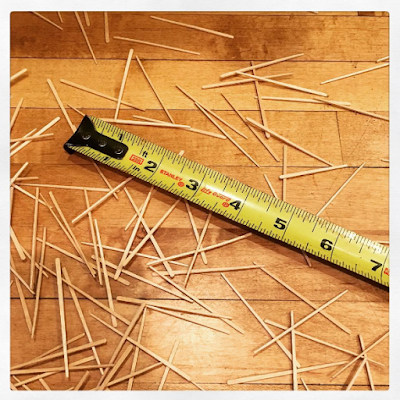 ), I dropped my box of toothpicks and watched all 700 or so scatter over the floor. Thankfully, I took this as a moment to model calm for the seven year-old who had eyes on the scene. And then, I quickly realized my opportunity. I pulled out eight inches of tape measure and plopped it down right in the middle of the mess. After the photo, I scooped up the useless picks and threw them in the compost. That's right. We have organics recycling now, free of charge thanks to the City of Minneapolis. And this is the story of this week's #TwinTuesday photo. I'm going to add in a bonus story about Grammar Camp, a ridiculous teaching ploy to which I've resorted. Basically, we got behind in our grammar instruction and to make a week of lessons and practice more palatable, I've made it campy, complete with "campfire" songs. I put that in quotes because I'm not actually making a fire in the classroom. Duh. Anyway, you might be shocked to know how many adult musicians have gone in for making and recording songs about grammar, mechanics, and punctuation topics. There are hundreds to choose from. My students' current favorite is this little ditty from the Grammarheads. They're singing it in the hallways, and I can't stop them. Enjoy. Awesome job, getting the job done.